You spent, you saw, you failed to stay. Fulham have lost each of their last nine league games, the second longest such run in their history, surpassed only by 11 straight defeats in 1961-62. This season’s relegation of Huddersfield and Fulham makes 2 April the earliest date by which two clubs have been relegated in a single Premier League season. Fulham are now winless in their last 19 away games in the Premier League (D2 L17) since beating Aston Villa in April 2014; this is the longest run in the division since Hull City went 26 away games without victory between March 2009 and August 2013. Diogo Jota on Sky Sports: "It's not important if it's against United or not. It's three more points. We know to be seventh is a high position. it is very important to reach that place but we are not obsessed with that. We are going game by game." Raul Jimenez: "These matches we need more than 100%. We improve and keep looking to win these types of games. "This will give us confidence on Sunday at Wembley (in the FA Cup semi-final against Watford)." Wolves boss Nuno Espirito Santo: "A good performance. We were having trouble with their shape and they scored. It was a fantastic reaction, we managed the game better. "It makes me proud to do it against such a good team. "The most pleasing thing was the reaction to conceding the goal. On Jota and Jimenez: "The partnership is very good - the more time they spend together, things come out. Mutual knowledge is important. "Sunday is exactly the same [FA Cup semi-final] - as long as we prepare well we can fight against he opposition. We will rest and go again." Manchester United boss Ole Gunnar Solskjaer to BBC Sport: "I think we played some fantastic stuff, first 20 minutes we should have been two or three up and I'm not exaggerating. "We didn't pounce on big moments in the game. "Scott McTominay played really well tonight, he's been excellent. He gave us a goal threat, energy and legs - very pleased with him. "There's a couple of mistakes from us. We gave them that first goal, we have to be honest. On Ashley Young's sending off: "when you're on a yellow and you go in you're always in danger of getting another one. He hit the ball but followed through and hit him. It's a yellow card. "At 10 men it's hard but we had to keep the ball. We didn't want them to put pressure on us. They scored with their first chance after the sending off and you have to give them credit for that. "Very disappointed with the result but pleased with the performance up until 75 mins. An excellent performance from the boys." Fulham caretaker manager Scott Parker speaking to BBC's Match of the Day: "Obviously bitterly disappointed, devastated for the football club and fans. We always knew it was a tough ask. It's the way we lost the game which was most disappointing for me. "The five or 10-minute spell from 2-1 onwards - if there was ever a watch then that was our season in a snapshot. "We played some nice bits at times, but at the end of the day you are where you are - that 10 minutes. Where did it go wrong this season? "I think in the initial reaction - I have ideas of [where it went wrong] but it's not the time to broadcast it. When a club gets relegated you know there are some serious issues. "At this moment in time, I'm not thinking anything. Just pure disappointment. "The team and the players owe it to the football club and fans to out in the last five games and give something back, although it'll be very little. The next five games, we will crack on." Fulham player Tim Ream on the full-time teamtalk: "There should have been [strong words] all season long. There were some home truths. "We'll see if it resonates with the guys. We will approach the remaining games like we have for every game. We will go out to try to get points, albeit meaningless points. "We haven't shown a togetherness, unity, desire, passion. We've shown it in bits and pieces, in the first half then go dead and flat. "We need to find it from somewhere. Guys need to speak up more in training sessions. "What we do in the match is a product of what we do between Monday to Friday. "What Scott Parker brings to the table is not ultimately down to me." 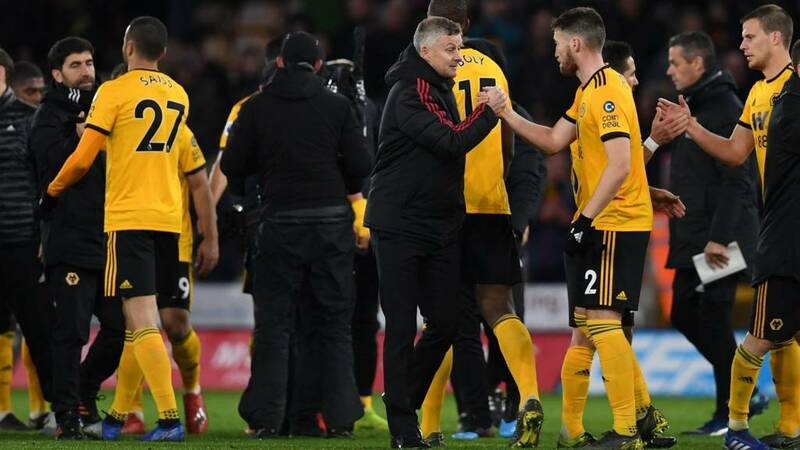 Wolves manager Nuno Espirito Santo speaking to BBC's Match of the Day: "Tonight was a good night, a good game of football. "What more can you ask? We know it was very difficult. The extra effort the boys make and they the react to the first goal - I'm really pleased. "I give credit to United for how they shaped themselves, it was difficult to recover the ball. The way we reacted was amazing. "Even after the red card it is always difficult against United. We created spaces and had more chances. If there's one thing I can complain about it is being more clinical. "The preparation starts now for the semi-final - we will rest and prepare for a difficult game. A fantastic challenge for us." Watford manager Javi Gracia speaking to BBC's Match of the Day: "Now is the moment to start to think about the next game - an important game, a semi-final. All the people are looking forward to the moment. To achieve 46 points is something amazing. On Will Hughes' spectacular goal: "I know what Will Hughes is able to do. He has high quality. When he is motivated in that moment he can do whatever he wants. "Not only him, but the whole team was much better in the second half. Fulham played better than us in the first half. "The team is keeping a good level throughout the season. Andre Gray is being very, very important in the past few games." Watford forward Troy Deeney: "The first half we were sloppy and complacent in terms of the basics. Then Andre Gray comes on and does his stuff. He got the assists today, but the two boys up front pressing has done the job. We're not the best two strikers in the league but we're grafters. "Andre's coming on and impacting games." Andre Gray on coming on as a substitute again: "I'm going to keep doing what I'm doing. It's the manager's decision and I'm here to respect it. When the team's suffering I try to help it." Scott McTominay was far better than Paul Pogba on the day. Wolves are a very good side, specifically a good passing side. If you give them space in midfield they will control games. Wolves boss Nuno Espirito Santo fist pumps his way over to the Wolves fans - what a sight! Much better than the light show (which, admittedly, has been impressive all season). A bad night for Manchester United, who remain outside the top four having played a game more than everyone else. It is the first time they have lost from a winning position since a 3-2 defeat at West Ham in May 2016 under Louis van Gaal. In other words, they never did it under Jose Mourinho. Paul Pogba is flagged offside. Wolves are seconds away from a great win.